The Corsair SP120 RGB LED PC case fans combine striking RGB LED lighting with high-pressure air delivery to make sure your rig stands out. Pushing up to 52 CFM while producing up to 26 dBA, the SP120 will help you finish your system with a dramatic look. 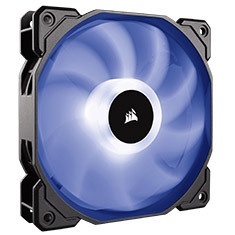 This package is an expansion of Corsair’s HD120 RGB LED fan kit that includes the RGB LED hub and controller.